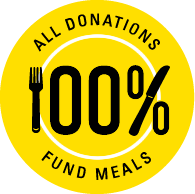 When Visible Hope began, we made a bold promise: 100% of public donations would go directly to food projects. We’d even pay back credit card fees, meaning if a donor gave $100 with a credit card and we got only $97, we’d make up the $3 and use the full $100 to provide food for people in need. With two completely separate bank accounts (audited independently) and never touched for any other purpose), we can guarantee that every public dollar donated helps bring food and other resources to people in need. And so far since our inception in 2010, more than 21K meals have been served to our homeless Veterans and other less fortunate men, women, and children throughout Madison County, Alabama. Here at Visible Hope we’re all about Transparency & Accountability. Visible Hope is the ONLY organization in the United States that uses 100% of donations to provide food and other life-saving resources to people in need. Visible Hope is a no-salary organization as we have been paid in full by God himself for our works. We give him all of the glory and praise 🙂 In addition to our Transparency & Accountability Model we always invite donors or anyone to come out to serve with us so they can see how their donation is being used first hand.